The St. Paul Athletic Club traces its beginnings to a gymnasium at Seven Corners, half a mile west of downtown. Opened in 1884, it offered memberships, classes, and public exhibitions. At $15 a year, gentlemen of proper social standing could swing from rings and bars, engage in Greco-Roman wrestling or practice the “manly art of self-defense.” Select classes were also offered to ladies and boys. The sole concession to non-athletic activity in the building was a reading room stocked with newspapers and magazines. Flush with turn-of-the century enthusiasm for civic progress, proud St. Paul city leaders announced to the world that their beloved city was a commercial and cultural player of the first order using the most persuasive civic voice of the era: through the built environment and the building of a magnificent downtown athletic club that opened in 1917. Now offering unparalleled style and service, the St. Paul Athletic Club Building continues to offer the community uncompromised quality, comfort, convenience and value. Beginning in 2008 with the elegant addition of Hotel 340 on its upper floors, and through the state-of-the-art remodeling of its fitness facilities, the Club has been re-envisioned and remodeled to create an utterly unique urban sanctuary, the one Club that has it all: Six floors of athletic facilities, swimming pool, café, bar and hotel. Combined, they create in the heart of the city an unprecedented and artful meld of service, quality, comfort and convenience—all just steps away from the Union Depot light rail transit hub. Its historic main lobby, as well as the glass-walled penthouse, also function as downtown facilities for the University Club of St. Paul. That means you will find the weekly cozy Thursday night happy hours downtown that are a stylistic signature of the University Club’s Summit Avenue hilltop hospitality. The goal? To ensure the Saint Paul Athletic Club Building plays a continuing role in the vibrant cultural and social life of the center city. By the first decade of the 20th century, athletic clubs had become a national rage, and they began to seek expanded quarters in monumental blocks with strong architectural signatures. Chicago, New York, Cleveland, and Pittsburgh boasted athletic club buildings that vied with the finest new architecture in their cities. In 1913 St. Paul’s club reinvented itself to align with the national trend. Drawing on its close affiliation with the Chamber of Commerce, it hired the eminent Minneapolis architectural firm of Bertrand and Chamberlin, chose a prominent downtown site at Fourth and Cedar, brought in the nation’s leading athletic club promoter, and promised to have a $400,000 building up by the end of the following year. But the onset of World War I stalled the project, the promoter left town under a cloud, and the plans were put on hold until enough membership pledges were collected to begin anew. In mid-1915, the club purchased the site selected two years earlier and demolished the derelict Union Block. They also switched to a St. Paul architect with an established national reputation, Allen H. Stem. In Stem’s hands, the plans were recast and expanded, pushing the projected cost to $700,000, a princely sum in that day. Site preparation and interior furnishings would swell the total bill to $1 million, the equivalent of $18.5 million in 2014 dollars. Among St. Paul buildings, only the State Capitol and Hotel Ryan—its 1883 cost adjusted for inflation—could boast a higher price tag. Stem’s design pulled in just enough English Renaissance ornament and ambience to fit in comfortably with genteel, countrified, social clubs across the country. That was standard architectural practice for athletic clubs. But St. Paul’s building also boasted a sleek, vertical look, lending it an unmistakably urban identity and uniting it visually with the commercial heart of the city. By 1917, the fabulous new civic wonder opened to an awed and appreciative public Pronounced an architectural triumph, its magnificent, two-story lobby, located at the heart of the first floor, drew special praise from the local press. Some of the vertical sensibility of the architecture grew from Stem’s innovative planning scheme. The dining facilities were shifted from their conventional top-story location to the third and fourth stories, creating a raised two-story arcade on the exterior and twenty-foot ceilings for the main dining room. The top three floors, with their sweeping views of the city and the river, were reserved for living quarters for members and their guests. Just below these were the athletic facilities, crowned by a swimming pool occupying part of the seventh and eighth floors and a gymnasium occupying part of the eighth and ninth floors. The interpenetration of these floors was architecturally expressed by another grand arcade, this one rising to a height of three stories. On the second floor, immediately below the main dining room, was the billiard parlor, one of the most elegantly furnished rooms in the building. Above the dining room was an office suite occupied by the St. Paul Association, a short-lived renaming of the Chamber of Commerce, and above that was the lavishly appointed main lounge. Together these spaces provided key locales for businessmen to meet and interact on an informal basis. To prove this point from the outset, athletic club management announced that formal clothes were taboo at the heralded opening festivities on September 27-28, 1918. Annual fees were also kept low, with the club’s financial health ensured by rental income and life memberships, available for $1,000. The latter also took care of most of the construction financing. The building was so successfully designed and engineered that it remained almost untouched for the next forty years. In the mid-1950’s, Ellerbe and Co. initiated an upgrading of the building’s mechanical systems that would carry into the early 1960’s. At the same time, the ground floor retail spaces were united into an office suite for the Chamber of Commerce, a glass-and–steel thirteenth (named the fourteenth) story was added to house an elegant restaurant, and several spaces in the mid-floor athletic facilities were rearranged. On the first story, alterations to the exterior walls removed all but the service entry on the Fourth Street side and created a new main entry at the center of the Cedar Street Side. The windows were also enlarged and simplified, and the women’s entrance was dispensed with. A planned multistory addition to the north never materialized. Additional remodeling by Ellerbe and others in the late 1970’s and 1980’s again reconfigured the ground floor of the building, including part of the main lobby. In 1979, BWBR Architects planned a massive new addition on the north side. Designed to accommodate handball courts, these attached a windowless, monolithic block to the northwest elevation, leaving the lower two floors void but for the piers supporting the addition above. In 1991, the St. Paul Athletic Club was disbanded, twelve years after its last major expansion. A public auction was scheduled for February 1, 1992, at which time most of the interior fittings, from antique pool stools and light fixtures to the billiard room paneling, would go to the highest bidder. At the last moment, an offer to purchase the building was accepted, and the remaining historic interiors, shorn of their furnishings, remained intact. For the next three years the building lay empty. Finally, in 1995, developer John Rupp purchased the property and began the task of restoration. Over the next seven years, the lobby, main dining room, and grille were meticulously restored; the old billiard room was reborn as a restaurant dubbed “Butler’s”; new bathrooms were installed at the rear of the first floor; a series of back rooms in the second floor were transformed into elegantly appointed, private banquet room; and the apartments on the tenth, eleventh, and twelfth floors were converted to offices. While the incremental restoration and adaptive reuse of the top and bottom floors of the building was underway, Lifetime Fitness, Inc., leased the athletic facilities on the fifth through the ninth floors and immediately upgraded both the facilities and their adjacent locker rooms. In 2000, the College of St. Scholastica in Duluth opened a St. Paul cyber campus in the building, occupying a totally re-outfitted lower level. A year later, the old bowling alley at the north end of the lower level was re-outfitted as well, nearly doubling the size of the classroom space. In the winter of 2005-06, the college spread its operations into the first and second floors of the historic building. Located in the landmark building of the St. Paul Athletic Club at 340 Cedar Street, Hotel 340 is the first boutique hotel in the East Metro area. In 2008, it opened 37 rooms on floors 10 and 11 of the Athletic Club building—just in time to conveniently and expertly serve the many delegates and guests attending the Republican National Convention held in the Xcel Energy Center. In 2010, the Gayot international travel guide to fine dining and lodging named Hotel 340 as a “Top 10 Boutique Hotel Under $150 in the U.S.” National recognition for Hotel 340’s leadership in style, comfort and value continued, and in 2011 Budget Travel listed Hotel 340 as one of their “World’s Best New Affordable Boutique Hotels.” That same year Lifetime Fitness moved out of the building, paving the way for the grand re-opening of the Saint Paul Athletic Club facilities within the Hotel 340 building. Growth continued with Hotel 340 services, offering guests unrivaled comfort, value and elegant ambience in lodging, dining and socializing. By May 2014, the 12th floor’s capacity grew by 19 rooms, thus completing the expansion of the hotel services in the building and bringing the total number of rooms to 56. By 2013, upgrades to the Saint Paul Athletic Club fitness facilities were completed. A grand reopening celebrated the return of this historic, major asset to the community’s health, wellness and fitness resources. The club occupies almost 70,000 square feet of the building property—and is far more than a glorious gym, though it is surely that. Massage therapy customized to meet your needs—Swedish/Relaxation Massage, Deep Tissue Massage, Trigger Point, Sport Massage or Reflexology—is always an option for bodies and spirits in need of renewal and relaxation. Hotel 340 occupies the top floors—10, 11, and 12— of the Saint Paul Athletic Club building. Given the soaring architecture, river views and sweeping skyline vistas are a natural amenity of most rooms in Hotel 340. For practical value, many rooms come equipped with fully stocked kitchenettes. 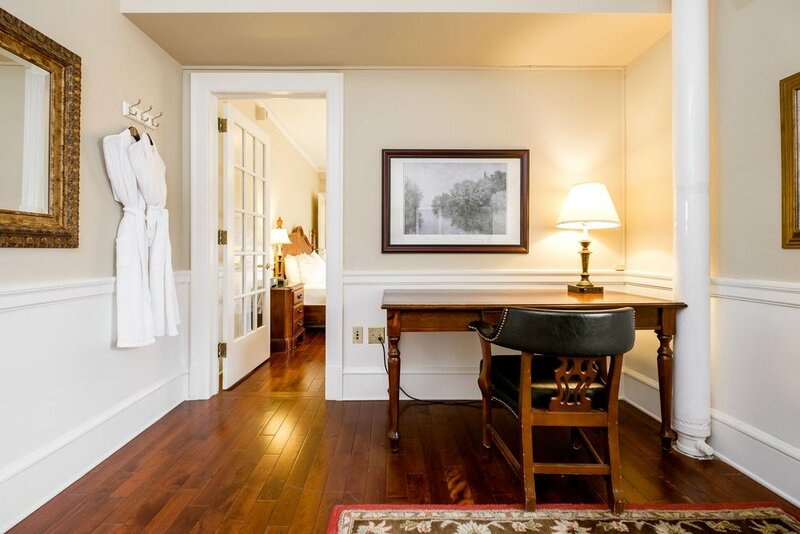 All rooms and suites possess the same charm and character as the rest of the property, and have been upgraded with modern amenities such as 1080p flat screen televisions, and Keurig coffee makers. In addition to occupying the top floors 10, 11, and 12, Hotel 340 offers guests access to the spacious second floor Butler’s Café for its breakfast room. Complimentary continental breakfast has been offered daily since the hotel opened. Replacing the original barber shop, the lobby bar menu offerings change seasonally. Guests may enjoy complimentary access the St. Paul Athletic Club’s state-of-the-art facilities. A century of service, style and commitment to the highest standards of hospitality suffuse the many experiences available in the Saint Paul Athletic Club building’s Hotel 340 in the heart of downtown St. Paul. In addition to central location and optimal comfort in lodging, options range from corporate events to private banquet celebrations, from intimate dinners to debriefing drinks after work, to a focused session with a top fitness coach or a quick workout. In each experience, Hotel 340 staff strive to surprise and delight by exceeding every expectation, every time in St. Paul’s newest, oldest urban sanctuary located in the Saint Paul Athletic Club building, 340 Cedar Street.